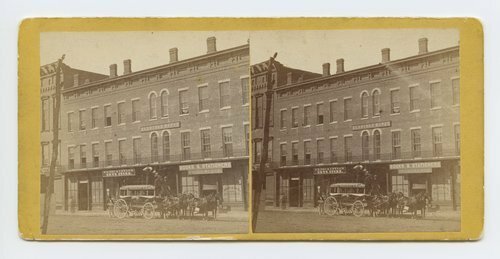 This stereograph shows the Eldridge House located on Massachusetts Street, Lawrence, Kansas. In front of the Eldridge House is a Rail Road Line horse-drawn omnibus. It is from Alexander Gardner's series, Across the Continent on the Union Pacific Railway, Eastern Division. Eldridge House, Lawrence, Kansas. 323 miles west of St. Louis, Mo.